The genus name Mystus draws up a bit of attention, mostly negative as most of them are assumed to gorge on tankmates and/or rip them to shreds. There is one species in this genus though, that defies all these stories, stands out as a dwarf species and is (almost) a schooling fish! I am talking of course about Mystus carcio, a dwarf bagrid native to north eastern India and Bangladesh. Mystus carcio was described by Hamilton (in 1822) as Pimelodus carcio from ponds in the northern parts of Bengal (now West Bengal), India. After being buried in synonymy with M. vittatus and M. tengara, it was finally revalidated in 2010. Mystus carcio can be easily differentiated from its closest congers, M. vittatus and M. tengara by its small size (maxing out at a little over two inches TL) and a very short adipose fin. Mystus bleekeri, another striped species from is which can also be easily distinguished from M. carcio by its long adipose fin. Although this species was available in the trade before 2010, it was mostly sold under the M. tengara moniker and escaped the attention it deserved. I got my first batch (of six) in mid 2011 from Dhubulia in West Bengal. These were kept with Rama chandramara, Pethia gelius and Parambassis lala in a standard 15 gallon tank. Substrate was fine river sand with smooth pebbles and driftwood for décor while filtration was through an 800 lph HOB. Although this was not really a planted tank, I had a bunch of Egeria densa to serve as additional cover. The tank temperature was maintained at around 27°C. Compatibility worked well as all these species are quite timid. 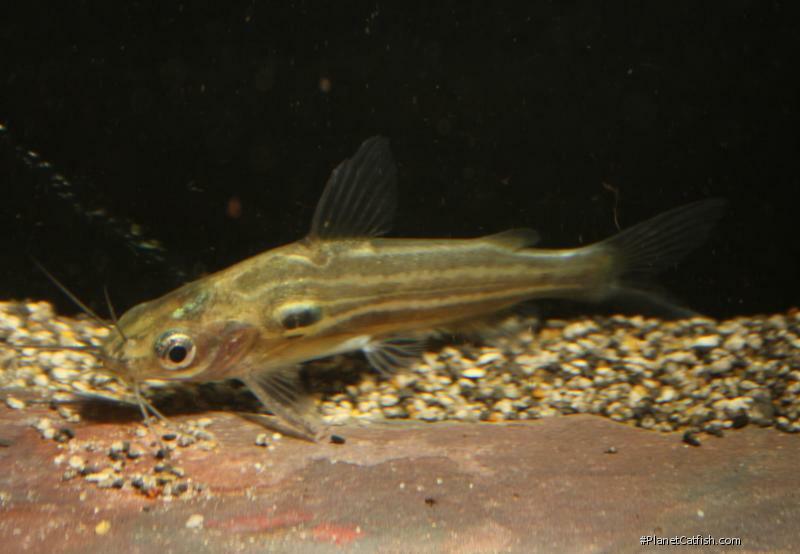 I relied heavily on live food (bloodworms and tubifex) but this species will readily take to processed food like Tetra Bits and other standard sinking aquarium food. Although the schooling behavior decreases once the fish settle in, it still was a sight to behold when it happened. Overall, an easy fish to manage even for the entry level aquarist and certainly makes a splendid addition to all planted tanks! Type Locality Ponds of northern Bengal. Mystus carcio can be distinguished from other striped Mystus by its adult size (maturing at 44.0 mm SL) and a short adipose fin. References An account of the fishes found in the river Ganges and its branches.